Indian dance provides both physical and emotional benefits, but it is first and foremost a form of worship and spiritual practice. 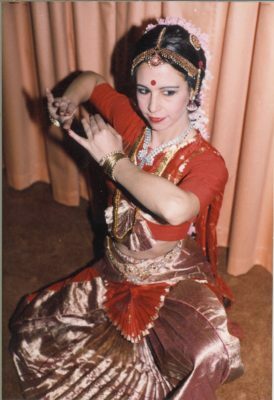 In 1981 I was living in England, teaching German at a university, when, one drizzling grey evening, I went to the dance performance of a young Indian woman. I returned enchanted, entranced, transformed. “You have to learn this” and inner voice said with absolute certainty. I didn’t understand why I was compelled to learn an obscure form of dance, but the calling nonetheless was loud and clear. I loved the beautiful silk costumes in rich purple, deep green, delicate peach, thickly embroidered with gold brocade, the luxurious exuberance of adornment with anklets and bracelets, jeweled belts and hair smothered in Jasmine. I loved the dancers grace, the strength of her stamping feet encircled with jingling bells, the expressiveness of her face. But as I look back, I see what really captured my attention was the glimpse of an archetype which I had never encountered before: the archetype of the temple priestess. Instantly, my soul leapt up in recognition and I cried out “That is who I am! 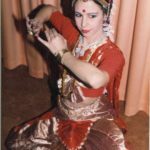 Her path is my path.” Several months later, I was on my way to India to study the ancient tradition of Indian temple dance.